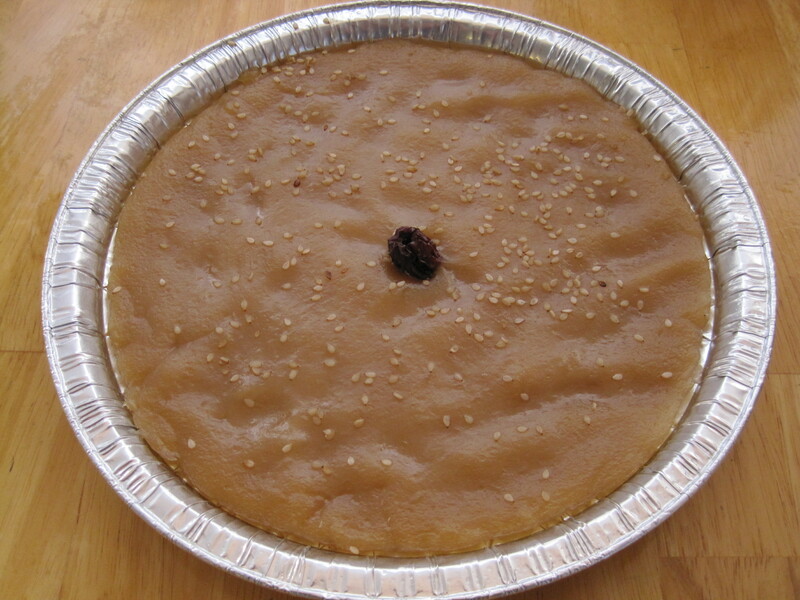 Nian gao is a steamed cake that is traditionally eaten at Chinese New Year. During the 2 week long celebration, nian gao is often given and received as gifts. It is a vegan cake made with glutinous rice flour (also known as sticky rice flour). Since it does not contain eggs or baking powder/soda, it has a chewy, dense, and slightly sticky texture. It really only tastes good when served hot, either from the steamer or pan fried (see photo below). Also, note that nian gao is not meant to be very sweet (but you can use more sugar if you’d like). There are variations of nian gao that you could try (ie. using coconut milk) and there are very good baked nian gao cakes too (see my recipe here). The recipe below is for the plain, traditional steamed cake. 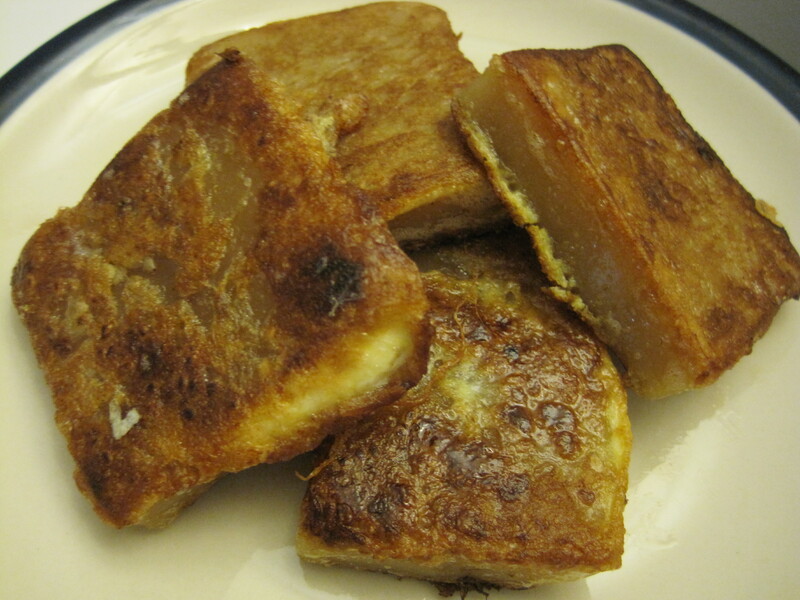 Photo below: Slices of the nian gao are coated in raw egg and pan fried in a little bit of oil. But some people prefer to omit the egg and pan fry the nian gao directly in the oil. Note: Nian gao is freezer friendly, so don’t worry if you can’t finish all of it. 5 slabs of Chinese brown sugar (“peen tong”) – Note: If you prefer a sweeter cake, use up to 7 slabs. Traditionally, the brown sugar slabs were shaved into flakes by hand with a knife. Now, to save time, people simply dissolve the sugar in hot water. I attempted to turn the sugar slabs into a powder using my food processor but it almost broke my favourite kitchen utensil. So, simply chop each slab of sugar into many pieces and place them into a large, heatproof bowl. Pour 2 cups of boiling water over the sugar, cover, and set aside until all of the sugar has dissolved and the syrup has cooled completely. If the syrup has cooled but your sugar is not completely dissolved, transfer this to a pot and heat it gently until the remaining pieces of sugar dissolve. Then allow this to cool completely. Meanwhile, lightly grease the round heatproof plate(s) that you will be using. You can use pie plates or disposable aluminum plates. You’re supposed to use a 9 inch round disposable aluminum plate that has straight sides (not sloped) and is 2 or 3 inches deep. However, these are hard to find. So, you can use 2 x 8-inch round aluminum pie plates instead. Set up your steaming equipment and bring the water to a rolling boil. (See my post on How to Steam Cook Food here.) I used a steamer rack in a wok covered with a lid. Make sure that the water never comes in contact with the bottom of the pie plate. In the bowl of a stand mixer, combine the glutinous rice flour and wheat starch (if using). On the lowest speed (fitted with the paddle attachment), add the cooled syrup gradually. Mix for 30 seconds. Then add an additional 1/2 cup of cold water and continue to mix on the slowest speed for 5 more minutes. The dough should be smooth, slightly moist, and shiny. Place the dough into the prepared dish(es) and pat the dough to ensure that the dishes are filled evenly. Note that this cake will rise slightly during the steaming process, so do not overfill the pans. Then gently press one end of the dried red date (if using) into the centre of the cake. Sprinkle over some sesame seeds and place into the steamer. Steam for 40 to 60 minutes, checking the water level every 10 to 15 minutes. Add more boiling water as needed and do Not allow the wok to burn dry. The cake is done when it pulls away easily from the sides of the dish and the top of the cake is evenly coloured light brown. As you remove the cake from the steamer, pour off any water that may have accumulated on top of the cake. Place on a wire rack and cool completely. You could eat it while it’s still hot, but it will be very sticky and it’s better pan fried. Store wrapped in syran wrap in the refrigerator or freeze it. When ready to eat, remove the cake from the pan and invert it onto a cutting board. Cut it into quarters. Then cut each quarter crosswise into two 2 inch wide strips (not into wedges). Each of these strips should then be sliced crosswise into 1/4 inch thick slices. Heat a skillet over medium high heat. Lightly coat the pan with vegetable oil. When the oil is hot, dip and coat the slices of cake with the beaten egg and place them into the hot pan. Do not overcrowd the pan. Pan fry each side until golden brown and crispy, about 2 minutes each side and flipping once. Then transfer to a clean plate (do not stack the pieces) and serve immediately while still hot. The insides will be warm, soft and gooey and the outsides will be slightly crispy.